No single model or scale can fully capture the causes of land change. For a given region, land changes may have different impacts at different places. Limits and opportunities imposed by biophysical and socio-economic conditions, such as local policies and accessibility, may induce distinct land change trajectories. 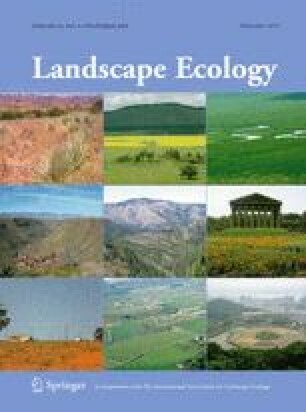 These local land change trajectories may, in turn, indirectly affect other places, as local actions interact with higher-level driving forces. Such intraregional interdependencies cannot be captured by studies at a single scale, calling for multiscale and multilocality studies. This paper proposes a software organization for building computational models that support dynamical linking of multiple scales. This structure couples different types of models, such as cell-space models with agent-based models. We show how results in multiscale models can flow both in bottom-up and top-down directions, thus allowing feedback from local actors to regional scales. The proposal is general and independent of specific software, and it is effective to model intraregional, bottom-up and top-down interactions in land change models. To show the model’s potential, we develop a case study that shows how a multiscale model for the Brazilian Amazonia can include feedbacks between local to regional scales. We thank the CLUE group at Wageningen University, The Netherlands, for providing the CLUE model source code and technical support for us to develop the regional model for Amazonia. This work is part of the GEOMA Network Project (www.geoma.lncc.br), a multiinstitutional Brazilian Science and Technology Ministry effort to develop integrated environmental models to subsidise policy action at multiple decision levels in the Amazonia. Gilberto Camara’s work is partially funded by CNPq (grant PQ 550250/2005-0) and FAPESP (grant 04/11012-0). Evaldinolia Moreira’s work is partially funded by FAPEMA (Fundação de Amparo à Pesquisa e ao Desenvolvimento Científico e Tecnológico do Maranhão).